Air monitoring is a critical part of any confined space work environment. A permit-required confined space is a confined space that presents or has the potential for hazards related to atmospheric conditions, engulfment, configuration, or any other recognized serious hazard. When do you monitor the air? 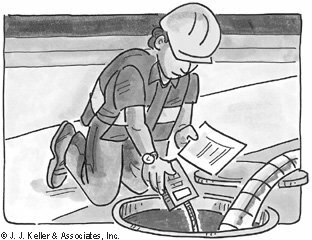 Air monitoring is necessary whenever employees are to enter a confined space, and periodi­cally while employees are in the confined space. The person in charge must know the proper use and calibration of the monitoring equip­ment, and supervise its use. Also, authorized entrants, those who will go into the confined space and do the work, must know how to use the testing and monitoring equipment. Either the person in charge or another designated employee is responsible for initial testing and periodic testing as necessary. · as necessary to ensure that the atmosphere remains acceptable during the work. · Test for oxygen first because most gas meters are oxygen dependent and will not provide reliable readings in oxygen deficient atmospheres. · Test for flammable gases and vapors second because the threat of fire or explosion is both more immediate and life threatening (in most cases). Finally, test for toxic air contaminants. Any employee who enters the space, or that employee's authorized representative, shall be provided with an opportunity to observe the periodic testing required by the rule.